Discussion in 'Pokémon - Diamond & Pearl: Galactic Battle' started by Serebii, Dec 24, 2008. Well i believe this will be quite interesting. As Bastiodon comes last that would mean steelix could come second and bronzor first. That makes me conclude that buizel could very well beat bronzor then get thrashed by steelix gliscor helps damage it a bit then gets chimchar withdrawn to defeated steelix then he evolves into monferno but gets defeated and gliscor beats bastiodon. I'll review this after the Christmas festivities, since everyone is waking up now, but here's the gist of the fight. -Hiko took out Bronzor, but the battle really took it's toll on the little guy. It seemed like they were both going to faint, but Hiko managed to keep itself up. -Byron goes with Steelix, Ash counters with Buoysel. Buoysel goes down really easily. And when I say 'really easily', I mean REALLY easily. Overkill to the max. -Hiko goes out against Steelix, still exhausted, with the effects of it's first battle clearly visable. But still, he manages to take out everyone's favourite overused pseudo snake. -MAGMA/AQUA BATTLE MUSIC. Hiko vs. Bastiodon. Bastiodon counters Hiko's Flamethrower with Metal Burst, and the ape finally goes down. -Glion's strategy is to try and hit Bastiodon from behind, just like Gravy has been suggesting. Oh, that Gravy and his correct assumptions. Glion gets behind it and clamps it's claws to Bastiodon's eyebrow things, before laying into it with a couple of Fire Fangs. -Glion wins, and is elated. Evidenced by it's Ash face glomp. Though i am not completely sure i think Chimchar won against Bronzor & then it was pulled back. I am not sure whether Buizel was defeated or withdrawn but Chimchar again defeats Steelix. I think Bastiodon defeats Chimchar & finally Gliscor defeats Bastiodon. Looks like he's finally hitting his stride. Cue the Buizel bashers getting hard over it's ho-ho-horrible defeat. -Byron goes with Steelix, Ash counters with Buoysel. Buoysel goes down really easily. I when I say 'really easily', I mean REALLY easily. Overkill to the max. Reminiscent of Pikachu vs Onix? No evolution in this episode?. Oh god, there will be riots now by the Chimchar fans who were so sure that this will be the episode. The battles were pretty shocking. Apparently blaze only works when the writers want it to work. There is no reason why Chimchar shouldn't have had blaze going for it. I know it wasn't the point but still Chimchar was "this" close to fainting a few times, blaze works in that manner. I'm glad Gliscor won, but I don't know it just didn't feel right. Bastiodon at most got hit with 3-4 fire fangs, and Gliscor didn't even use screech. I know it hurt but the last fire fang "exploded." 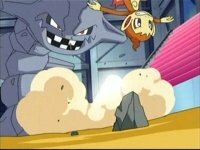 Gliscor did use sand attack which was cool. Ash won so Candice is next, I hope they aren't speeding it up. Oh and poor Buizel, didn't get hardly anything in before fainting. Of course Ash was just letting Steelix knock Buizel around. Of course it doesn't help that Steelix used screech before using Iron tail. As for Chimchar he's got 4 gym wins. I think its time to evolve. The animation really makes this gym battle look epic. ChaosMage Izit cuz I is black? God, Buizel looks proud of itself... dunno why. I would have far preferred Grotle in its place, even getting owned, cause at least it would feel necessary. And I love how Ash went with Gliscor in the first place- he did have Grotle and Pikachu as options but instead he chose his underdog and it paid off. Gotta love that guy. So after a year of being Ash's most overused pokemon, Buizel gets its smug arse handed to it by a pokemon which has been taken down by a good number of his predecessors, and doesn't even get a look in against the big boys in this one. Merry Christmas, Pokefans! Almighty Zard He has returned. i was one of the people who thought it might happen but i'm not going to riot because i knew deep inside it wasn't going too, nothing like that ever happens in gym battles, and at least Chimchar did well, that's all i could ask of it. now on the other hand if it evolves in the riley episode i will likely riot as it's too predictable, unorigional, and uneventful. How would it be unoriginal? Someone else have a Chimchar evolve on Iron Island that I didn't hear about? Aerodactyl? It's been a long time fellas, I guess you got out of that cave, eh? -TR sneaking, always a blast. -BUI BUI! BUI BUI! BU...SMACK! -And Dawn seeing parallel's in Roark and Byron's Onix and STEELIX THE STEEL ONIX? Points for you. -Chimchar gets taken down quickly by Bastiodon, but it did nicely in that gym, like Staravia in Veilstone. -Gliscor gets to sink those spicy chompers into Bastiodon's backside, that's gotta hurt. -ZOMG ADVANCED ADVENTURE REMIX TIG OLD BITTIES MAY OH THE MEMORIES AND SAD FANBOYS LED BY CYBER CUBED! -Gliscor gets the win, proves itself, and makes Chimchar's gym wins mean something, too bad Buizel only tie with LucariZOMGUBERKEWLMERCHANDISESOITWILLNEVERLOSEOUTSIDEOFFLASHBACKS or Staravia's wins might have been a bigger deal. -Ash gets his 6th Badge...hooray! Now it's one to Candice and eventually wrapping up the Galactic plot. Overall, everything was good. Will Staravia and Pikachu finally star in the last two gyms? Will anyone match Byron's awesomeness with his shovel? Will I ever stop talking with questions? Do you even want to know? Well a very merry christmas for Chimchar and Gliscor. A battle that finally went the way I thought it would. I don't hate Buizel but is definitely nice for Chimchar to have a gym win for a change, especially two, AND for Gliscor to get some serious ownage in a fight. I am also pretty glad there was no evolution, I feel like when there are during a gym battle it can take away from the fights ultimate effect. I pray and wait for these episodes, I take evolutions like hopefully Chimchar, as little presents along the way. I knew Chimchar wasn't going to evolve by the preview of it facing all three of Byron's Pokemon at some point. and I hoped it don't . It can wait for that Riley episode..
All of Ash's pokemon look happy and proud in the gym win shot regardless of rather they get a gym win or not because they are collectively happy that the team got the badge. And of course he wasn't gonna go with Pikachu or Grotle this battle, have you not noticed that this series hes actually picking his pokemon based on type. Well when you consider that the visit between each gym town was about 15 or so episodes, and they visited Hearthome 3 times I think where we are right now is fine. Chimchar showed its tough spirit once again, and for the 2nd time got 2 gym wins. Way to go. Its really flourished under ash, though when i look back at it, it always got done what paul wanted it to do, for the most part. I know the buizel haters are just orgasmic right now. And way to go for gliscor, though its win would have been better had it gotten a screech or two off, since Bastidon isn't really weak against fire just neutral. But in any event this is a great comming of age when you consider what it used to be. Pokemon, Games, Gundams, what more do ya need? This gym was all right. The biggest disappointment was Symphonic Medley. Toward the end, I prayed that they would not use Symphonic Medley, as it's one of the worst music pieces ever (esp. for battles) so I just /sigh when it started playing >_>. I'm also getting quite tired of Hikozaru at this point. Boring moveset due to it still being base stage, and it got 4 gym KO's in a row now. It's soon more overused than Bouysel. However, the Veilstone Gym battle is still the best one in Sinnoh, imo. I'm very happy that Gliscor won, especially since it's sounding like it had a good bit of HP left when it did. Along with that, Buizel getting KO'd quickly and Chimchar taking out two of Byron's team makes for a very nice Christmas present. For once, a Gym battle goes exactly as I would have done it (if I didn't have any choice about who was used in it, anyway). PLEASE feed Farfetch'd sour (yellow) berries! God, I'm going to miss Byron. Never has a gym leader been such a wonderful blend of both the epic and the psychotic. Him and Wake need to meet, preferably in a cage match, armed with metal chairs, shovels and terrible acting skills. With the way many Gym Leader's initial pokémon have been swept under the rug this series, I honestly hadn't been expecting anything grand when it came to Bronzor. Hiding something like that under a carpet probably wouldn't go unoticed anyway. Anywho, this was a pleasant surprise. Bronzor isn't likely to get much more focus after this I'd wager, so if this is as good as it's gonna get for the heat-resistant mirror, I'm more than content. Continuing from there, Hiko's battles were very impressive, and it was great to see the little guy pulling off two victories all on it's own, despite it's obvious exhaustion. With all the previous claims about it becoming 'weak' since Shinji callously abandoned it, you can't help but feel smug for being on the ape's side all along. You can tell Iwane’s team must have a lot of fun animating this guy, with all the acrobatics, the rubber-hose arms and different camera angles they got to use. I was rather surprised that Blaze wasn't activated, especially with that 'cliffhanger' before the commercial break. I'd half expected him to break out the insanity once the pokémon and food ads were done and dusted. I would have at least liked to have seen it against Bastiodon, since that match didn't last too long anyway. It could have been his undoing, the lack of control giving an experieced guy like Byron the advantage, goading Ash to work on getting the ability down pat on Iron Island. Ahh well. C'est la vive. While I'm not all too fond of Buoysel's incessant usage, fortunately I haven't stooped down to the mindless hate vendetta most forum members seem to have for the fellow. Oh yeah. I’m callin’ you guys out. I did feel rather sorry for him as his dual-tailed buttocks was served up on a silver platter, with all the trimmings and condiments to boot. I at least expected him to get ONE attack in, but damn, the whipping he took was fast and furious. While it certainly did look painful physically, there didn't seem to be any damage inflicted on the guy's pride. That is, if his willing acceptance of Ash's sympathy was any indication. But when all is said and done, the sadist in me can’t help but enjoy the occasional clean-sweep. C’mon, Steelix may be a bunch of buttholes by nature and more common than winged rats in Trafalgur Square, but you’ve got to give credit where credit is due. Gliscor's fight was quite satisfactory, considering it was it's first proper victory and gym debut. The lack of screech usage to incapacitate Bastiodon was rather disappointing, since it’s something I’d been hoping Ash would take advantage of. But never the less, I did enjoy the rest of this battle's elements. Gliscor tripping Bastiodon with his tail when he was flat on his stomach, in order to avoid getting hit by another dose of generic energy beam was probably my favourite part. And I was quite fond of Sand Attack being used to sneak behind ol' fort face, before landing that deciding Fire Fang. ‘Boo’ on whoever said it was a crappy technique. Using the air current produced by an incoming Luster Cannon in order to avoid the very attack was also quick thinking on Ash's part. Sinnoh is still delivering, and I've got high hopes that this'll be the first series where I've actually enjoyed every Gym. C'mon guys! Don't make an outcast out of Gravy by proving he's a horrible jinx!